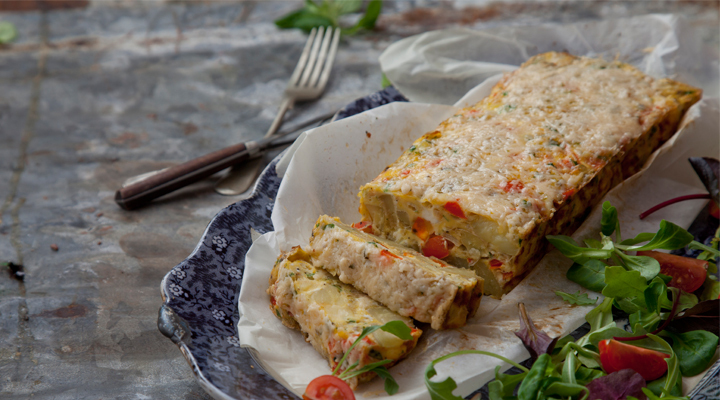 This classic Spanish Omelette has very few ingredients and can be enjoyed for breakfast, lunch, dinner or as a snack. Steam the potatoes for about 20 minutes, until softened. Preheat the oven to 190°C/gas mark 5. Generously grease a 1lb loaf tin with butter. Heat the olive oil in a frying pan set over a medium heat. Cook the onion and garlic for 5 minutes. Place the potatoes, onions and garlic in the greased tin, spreading them out evenly. Beat the eggs in a large bowl, then mix in the sour cream and season with salt and pepper. Pour this over the potatoes. Place the tin in the oven and cook for 30 minutes. Remove from the oven and scatter the grated Cheddar on top, then cook for another 10–15 minutes, until the egg is completely cooked through. Rest for 10 minutes before cutting into portions and serving.